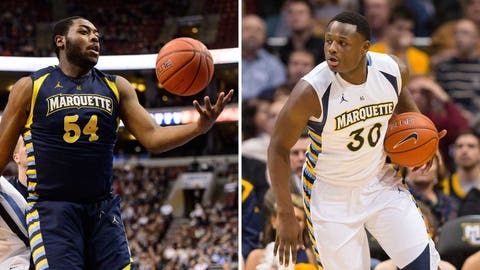 Marquette senior forward Davante Gardner (left) was named the Big East's Sixth Man of the Year on Monday, while sixth-year senior center Chris Otule won the conference's Sportsmanship Award. 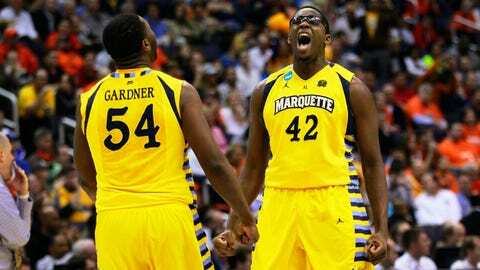 Marquette senior forward Davante Gardner was named the Big East’s Sixth Man of the Year on Monday, a day after being picked to the All-Big East second team. Sixth-year senior center Chris Otule was also honored, receiving the Big East’s Sportsmanship Award. "We’re thankful for the coaches’ respect and votes for Davante and Chris," Marquette coach Buzz Williams said. "I think that’s a tribute to what they’ve done throughout their career here. Selfishly, I believe they are both deserving of it." Gardner is the first player ever to win the award twice, as he also was named Big East Sixth Man of the Year after the 2012-13 season. He leads the Golden Eagles at 15.1 points per game and is averaging 5.7 rebounds, starting just eight of 31 games. Gardner shot 52.5 percent from the field, sixth-best in the league. Otule, who was granted a sixth season in 2013-14 after receiving a medical hardship waiver from the NCAA, averaged 6.0 points and 4.3 rebounds for Marquette. He started 30 of 31 games, coming off the bench for a game due to an illness. Former Marquette guard Junior Cadougan won the Big East’s Sportsmanship Award last season. Seton Hall guard/forward Fuquan Edwin was named the Big East’s Defensive Player of the Year, while Villanova’s Darrun Hilliard and Daniel Ochefu shared the Big East’s Most Improved honors.